Mike Diver lives here. Not literally. This is the Internet, not a house. June 20 – just me! July 18 – just me! August 22 – something of a summer party with Ghostpoet and full supporting bill, more details soon! Book me to DJ at your show. I am cheap. Twitter. Songs in the order they were played at November’s Dive Slow, aka me playing records at Sticky Mike’s Frog Bar, Brighton from when I arrive until everyone goes home. Note for those coming next time: it’s great that you like what I’m playing, and I’m totally up for being your friend. But I’m not a cloakroom. So please don’t ask me to look after your stuff, as while you’re welcome to leave it on the floor beside my feet, I’m a bit busy to be keeping an eye on it. What with the whole DJing aspect of me being there. Speaking of Next Time: it’s a Christmas special! It’s on December 13th! It starts at 9pm and is totally free! And there’s a guest DJ, just like there was last year! This year, it’s dan le sac! That’s him pictured! Hooray! FACEBOOK EVENT. You get the idea. Between those opening and closing banks, stuff by acts like: A$AP Rocky, Pharrell, Dizzee Rascal, J Dilla, Zomby, Machinedrum, M.I.A., EPMD, Rick Ross, Flatbush Zombies, Nas, Earl Sweatshirt, Souls Of Mischief, Dr Dre, Kendrick Lamar, 9th Wonder, SBTRKT, Drake, Childish Gambino, Danny Brown… and Sisqo. Oh hell yeah. Played ‘Thong Song’. Not for the last time. 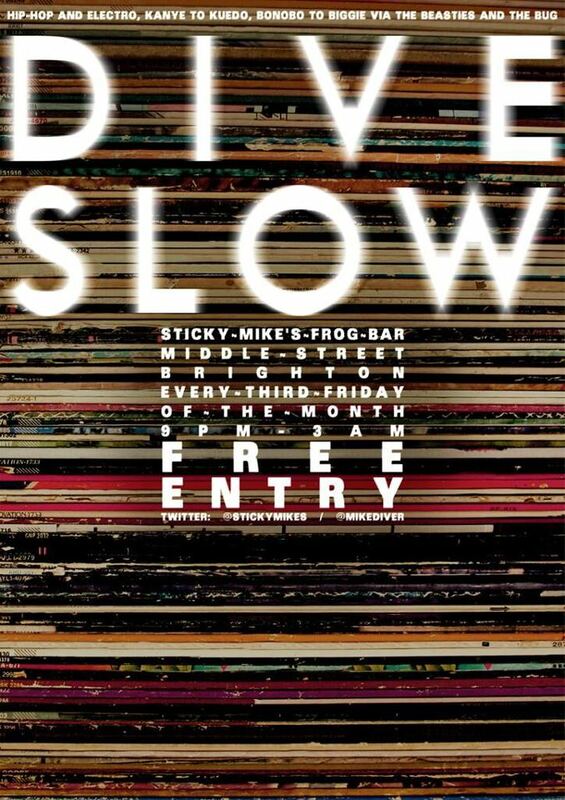 Dive Slow always happens at Sticky Mike’s Frog Bar – information, listings, directions, HERE. Another month, another Dive Slow (me, playing records, one after another). The next is September 21, if you like what you see below and fancy popping along. Flyer after the playlist. Went a little off-piste the other night. Sorry (?) about that. Crowd influence. Dr Dre feat. Snoop Dogg – Still D.R.E. On again next month. Come? I won’t play that drummer from Genesis. Promise. Okay, I promise nothing.